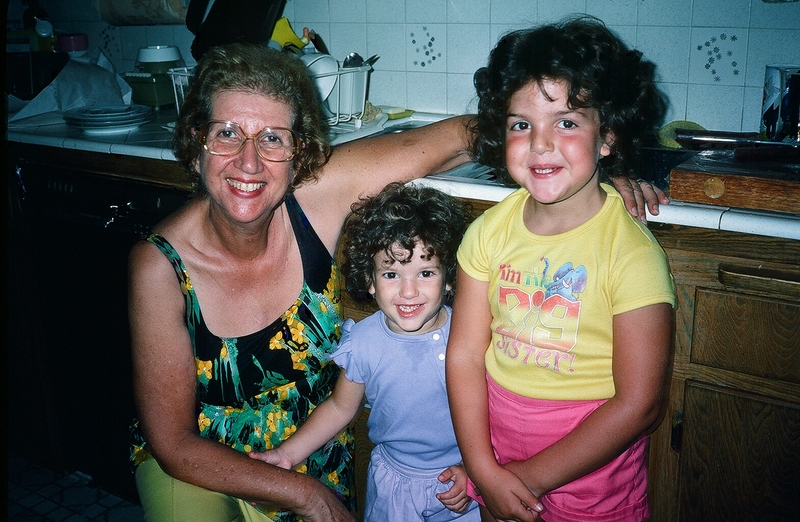 1 Kislev, today on the Hebrew calendar, marks the 12th yartzeit (anniversary) of my GRANDMA’s death. Today I choose to remember my GRANDMA as the woman who could get down on one knee to pose for a picture in awesome 1980s clothes. The GRANDMA who was the definition of a picky eater and from whom legendary stories exist about taking Kentucky Fried Chicken (it wasn’t KFC then) out of the bucket and serving it on fine silver platters. The GRANDMA who LOVED to shop. She made some fine purchases, too. I still wear the robe she bought me at least 15 years ago. The GRANDMA who loved me unconditionally and I know would be SO PROUD of all of the work that I am doing to make the world better (and you can be sure she would LOVE to tell you that I’m a rabbi). This entry was posted in family, memories and tagged family. Bookmark the permalink. Lovely tribute to Madeline. And, yes, she would be extremely proud of you. I sill need to call you and will do so today or tomorrow. Please email me with the best number to call (rabbihcohn1@cs.com).